(Nanowerk News) A new physical quantity of electrons—orbital angular momentum—has been generated by Masaya Uchida and Akira Tonomura at the RIKEN Advanced Science Institute in Wako, Japan. The work, published in the international science journal Nature ("Generation of electron beams carrying orbital angular momentum"), could establish novel fields of research and lead to new electron microscopes. “The ability of optical waves to spiral about their axis as they propagate, which can be described as corkscrew wavefronts, has already found a wide range of applications” explains Uchida. A wave can be characterized by the shape of its wavefronts: imaginary surfaces that connect all points where the wave is at the same stage in its oscillatory cycle. In a conventional plane wave, these fronts are a series of flat surfaces oriented perpendicular to the direction of propagation. Figure 1: Electron waves that spiral like fusilli pasta are a sign of electrons with non-zero orbital angular momentum. 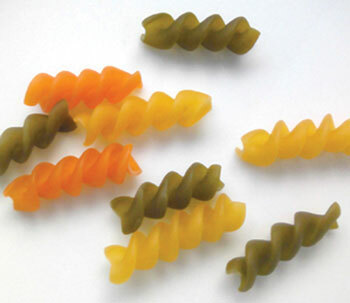 Some optical wavefronts are shaped like fusilli pasta (Fig. 1); the wavefronts rotate around a central axis and therefore have momentum, orbital angular momentum to be specific, which is associated with the wavefront’s shape and pitch. Since electron waves act like optical waves, Uchida thought that spiraling electron waves were possible. The researchers had to resolve a daunting technological challenge to generate the electrons with orbital angular momentum. A corkscrew wavefront is imprinted on an electron plane wave when it passes through a three-dimensional (3D) structure shaped into a single twist of the desired spiral. But since the height of the twist—determined by the wavelength of electron wave—is less than 100 nanometers, creating such a spiraling nanostructure is difficult. The researchers simplified this problem by approximating the spiraling structure to several linear steps like a spiral ‘staircase’. They crushed the graphite from a pencil into thin films and placed them onto a carbon-coated copper grid. These fragments formed stacked layers resembling a spiral staircase. To prove that the electrons gained orbital angular momentum as they passed through this simple 3D nanostructure, Uchida and Tonomura mixed the output wave with a second plane wave. They observed the characteristic ‘Y’-shaped defect to the parallel-lines pattern that is expected when two plane waves interfere. Measuring the transfer of momentum from the electrons to matter, however, could be a more direct way of identifying spiraling electron waves in the future, the researchers note.